You can often diagnose problems with your scanner by checking its lights. The Ready light is on The scanner is turned on and ready to scan. The Ready light is flashing The scanner is scanning or initializing. Wait for the Ready light to stop flashing before turning off the scanner. Check the scanner connection to your computer to make sure it is secure. 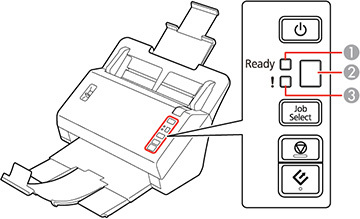 Make sure the scanner cover is closed and there is no jammed paper inside. If the ! error light is still on, turn off the scanner, then turn it on again. If the error continues, the scanner may be malfunctioning. Contact Epson for support. The ! error light and the Ready light are flashing alternately The scanner firmware is updating. Do not turn off the scanner or disconnect any cables until the status lights have stopped flashing. The ! error light and the Ready light are flashing at the same time A scanner error has occurred. Turn the scanner off and then back on again. If the error continues, contact Epson for support. The numeric display shows The Job Select button is unable to select saved jobs from Document Capture Pro because the scanner is connected to a network.